Living in Arizona for 12 years meant trips to California were a frequent thing and Laguna Beach in particular was a favourite jaunt. Laguna Beach itself is just about the perfect sized, there is a lot on offer and yet it still has quite a small town feel. Obviously the summer months are heavy with tourists but if you visit off season you will be amongst the wealthy locals and the beaches will be less crowded, although the surfers are out in any weather. Whilst the beaches and the ocean are the stars of the show you must find time to walk through the neighbourhoods and into the Laguna Hills – it has a very peaceful vibe away from the main drag and the homes are gorgeous. Many Hollywood executives live here and it’s seen its fair share of Hollywood royalty over the years, including Ms. Bette Davis who lived in a magnificent home overlooking the ocean in the Woods Cove area, just look for the D on the chimney stack! You can read more about that here. There are many places to stay in Laguna Beach with various styles and price points to fit everyone. My ultimate choice every time is Surf and Sand Resort. The resort is part of the JC Resorts family which includes the Rancho Bernardo Inn, San Diego and Scripps Inn, La Jolla (more on those in a future blog post). Here are 5 reasons why I love Surf and Sand, Laguna Beach, California. There are plenty of Laguna Beach hotels with beautiful ocean views but Surf and Sand is actually ON the beach. At high tide the waves crash on the walls and if, like me, the sound of the water rushing forward then slowly back soothes you and makes you smile, then this is the place for you. There is access to a private beach for hotel guests where chairs and umbrellas are offered, and you can order food and drinks from the pool bar without having to move from your sea side seat. The resort is also perfectly located to take in all of Laguna Beach, just a short stroll to the centre of town where you’ll find great shopping, art galleries, restaurants, cafes, coffee shops…the Laguna Coffee Company is a particular favourite when we’re in town. Most everything can be explored by foot so park your car when you arrive and don’t think about it till you leave. Not having to drive in LA traffic is always a bonus! The wow factor hits you the minute you open your room door – the first thing you see (and probably hear) through the floor to ceiling patio doors is the vast ocean. I imagine everyone does the same thing, drop the bags where they’re standing and head straight to the balcony without even looking to see what the room is like. Opening those doors and stepping onto balcony is an instant relaxation moment. The rooms themselves are very comfortable and the décor has just the right amount of beach themed touches without going over the top. The placement of the beds is perfection – at a slight angle facing the view – they know this is the money shot! From the bed looking out you can almost imagine you’re on a cruise ship as you see nothing but water. A note here that although all rooms have ocean views there are some that are set a little further and have a view of the pool too. The sweet spot for me is in the Ocean Front Towers. You can take a look at the various room types here. Laguna sunsets are beautiful and always worth toasting to. I have a few places at Surf and Sand where I like to enjoy my sundowners. For those days when getting dressed to go out in public seems a step too far, then hopefully you’ve had your champagne chilling all afternoon and will be enjoying the sunset show from the privacy of your own balcony. Maybe you’ve been out all day and just getting back to the resort, you fancy a gin & tonic and a snack to watch the sunset with, then head to Splashes Bar. 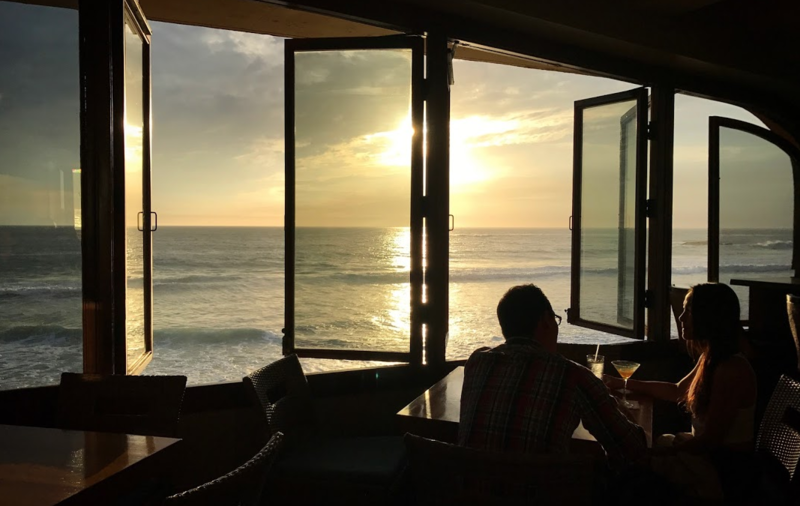 It’s an intimate space next to the main restaurant and the windows are usually wide open so you have the sound and smell of the surf. A lovely place to transition from day to night. Having eaten breakfast, lunch and dinner at the Surf and Sand restaurant Splashes my favourite meal is always breakfast. Whatever time of day you eat here the food is high quality and thoughtful, evening dining is a treat and feels special and romantic, lunch is always satisfying, but for me Splashes in the morning makes me happy. Something about the peacefulness of the restaurant at that time of day, combined with the sea views and ocean sounds, iced tea brewed just right, berry parfait with granola, creamy yoghurt and berries with a side of sausage (no breakfast is complete with a side of meat product!) and I must confess there is probably a warm, crusty pain au chocolate thrown in there as an “appetizer” – it just starts my day off right. The Aquaterraspa is a sweet little nook tucked away in the resort. The spa has 8 treatment rooms so has a calm, uncrowded vibe and the facilities are ample with, “lounge areas separated by gender and an indoor eucalyptus steam room, outdoor Jacuzzi, showers, and all locker room amenities. An intimate co-ed relaxation area with a fireplace, refreshments, and indoor and outdoor seating is also on premises”. The therapists are friendly and highly skilled. After any treatment I head to the outdoor patio to relax quietly amongst the tall trees that rustle in the breeze, stretch out on a sofa and look up at the blue sky thinking, “Today is a good day”. There are many more reasons I love Surf and Sand Resort in Laguna Beach so I will call this my highlight reel. Right, I’m off to do some California dreaming.